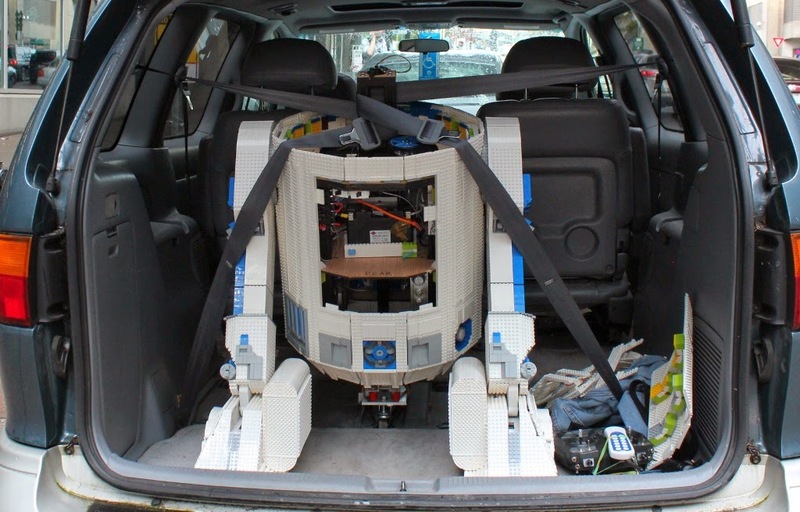 People have asked several times how we transport L3-G0. It's actually really, really easy. 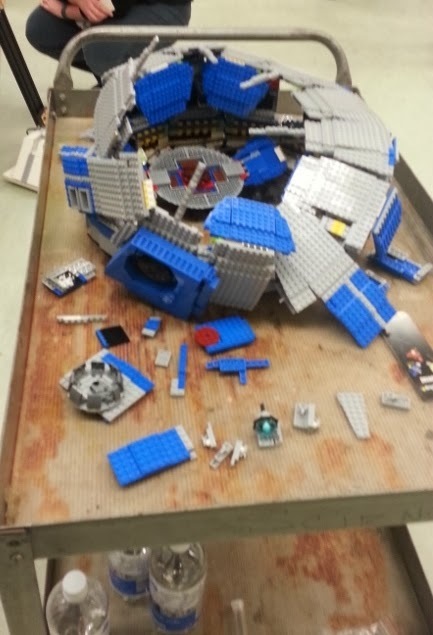 Many MOCs (My Own Creations) are fairly fragile. I was terrified of figuring out how to move L3-G0 and that was in fact one of my first experiments. I had tons of bungees and other stuff ready to move, plans for a plywood base and all sorts of stuff. Moving the Lego Space Needle is pretty challenging. I feel happy that it only takes 1/2 hour (usually) to get it back together now. 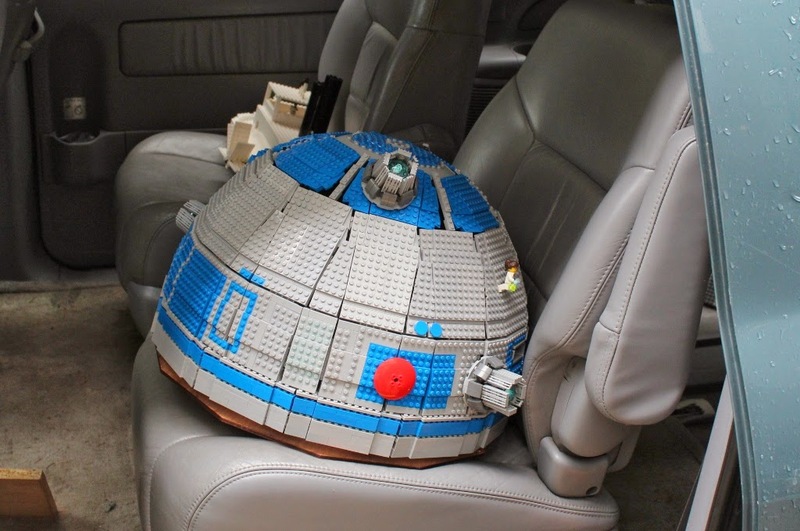 That's only 4500 bricks. 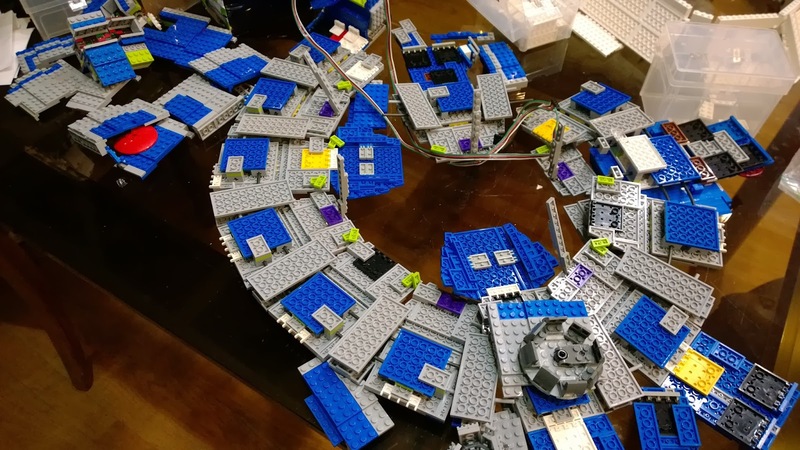 L3-G0 is closer to 16,000 bricks! So I figured it'd be harder. 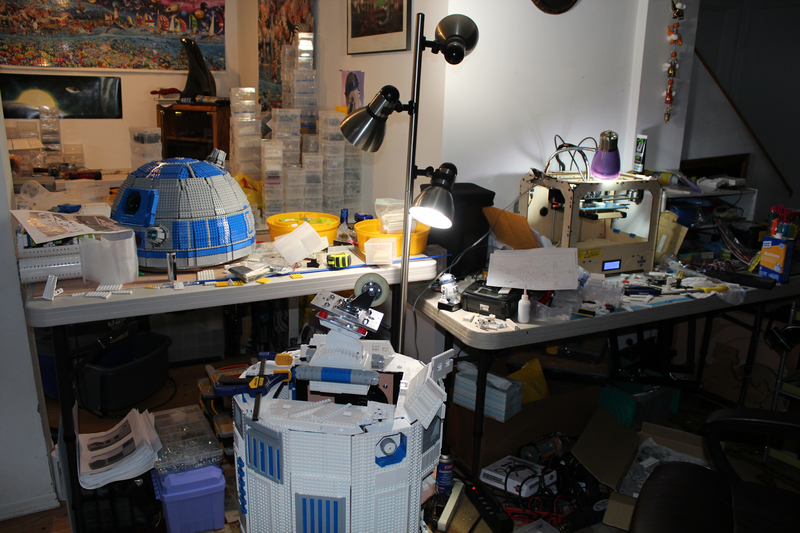 He's only 60-65 pounds or so (almost 30kg), so unlike many other R2-D2 builds he's not too hard to lift. The first part is to take off his head (remembering to unplug the wire helps) and stick it on the car seat, careful of the holoprojectors. I put the seat back up as far as possible, but don't really worry about strapping it in or anything. Then we pick up L3-G0's body and put it in back. The front foot shell comes off and the casters get shoved in around the rear seat's mounting point. Hooking the bungee around the top of the foot is about the only hard part since the hooks don't have much room on the mounting point. 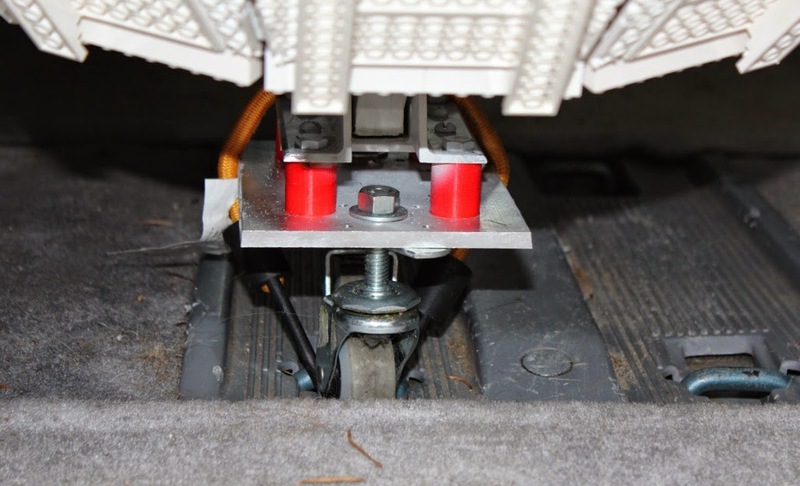 And then last is to merely hook the back seat belts around the central foot guide post, pulling them to ratchet tight (like you would a child seat). Again, watch the wire on the top. The sad thing is that getting the bungee is sometimes tricky, and the last step, the seatbelts, is so simple, that I've forgotten about the seatbelts about three times already. Fortunately the last two times I caught myself, but on the way to Hosik's science fair we were late & rushing, so I drove down the driveway with them off. I was reminded to fix it when L3-G0 fell over on his face. Fortunately it didn't do much damage. Anyway, once he's secured, the model's ridiculously stable. It barely moves and I don't need to be nearly as careful driving as with the other models. (The Space Needle wants the sections I divide it into to fall apart, and the Lego Disney Wonder's nice wooden platform has slippery velvet on it, so it wants to slide around. The worst part for L3-G0 is putting the front shell back together. 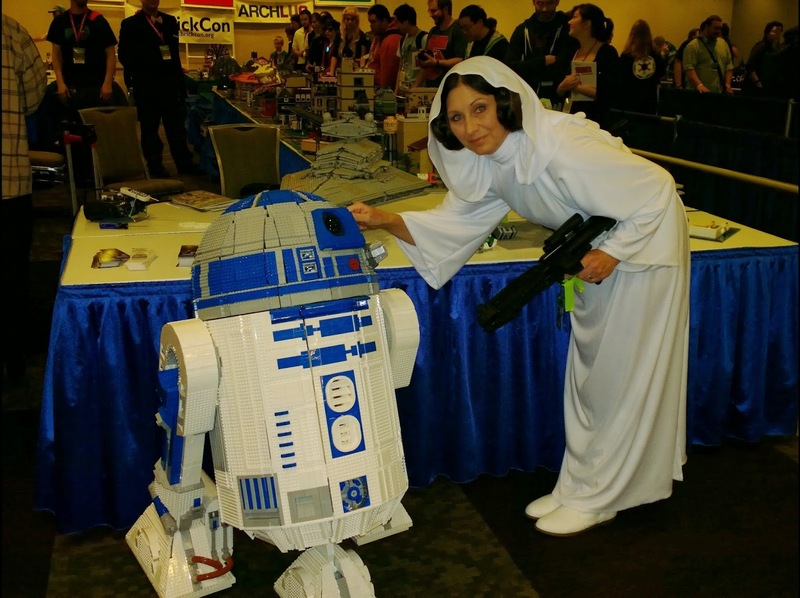 One of the fans attending ECCC, Lily, was dressed up as Darth Vader when she came to visit L3-G0. 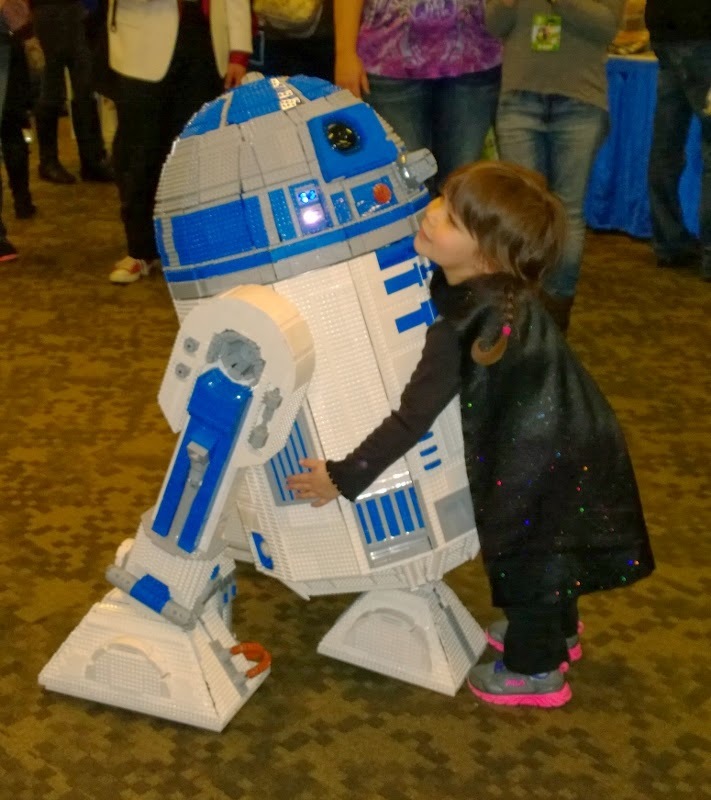 Her dad asked her to go put on her Vader mask and pose with R2-D2. 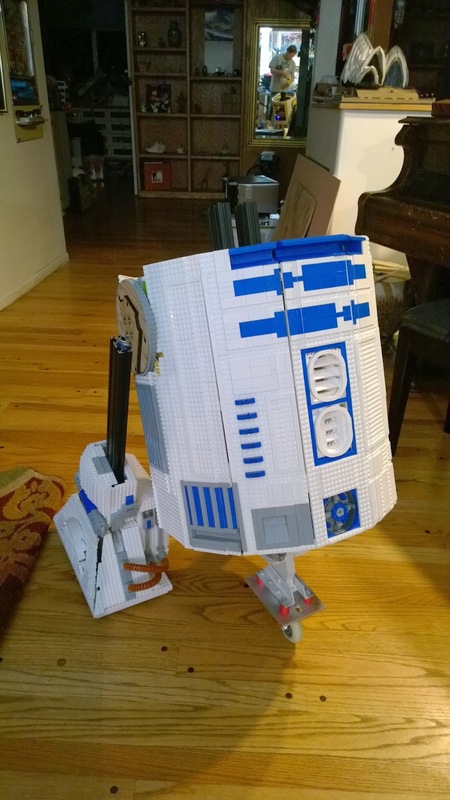 As she came up, "R2" saw "Vader", made his sad sound and backed up. She came closer and he did it again. And again. Lily didn't like R2 being sad, so she took it off and showed him it was just a mask. Then she gave R2 a hug to comfort him. She talked to him a lot saying how she saw his movie and he was her favorite robot and other stuff again. 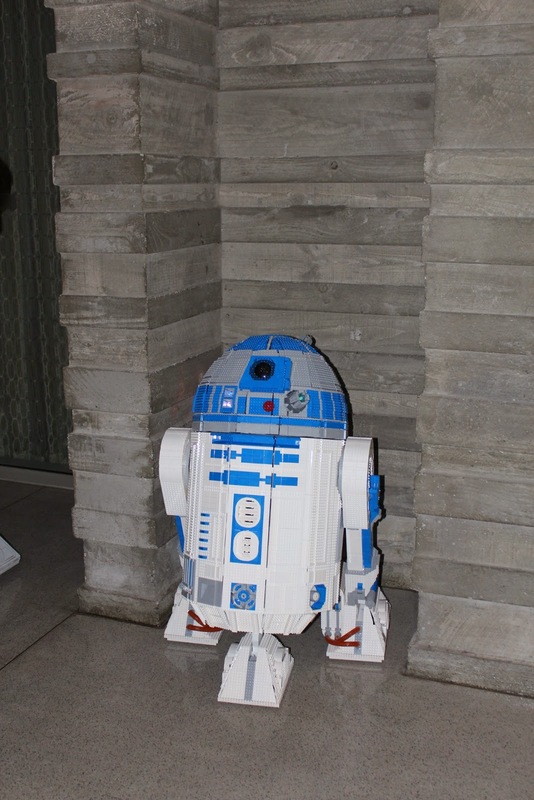 Everyone wanted to put the mask back on again to take pictures, but she didn't want to scare R2 again. They "talked" a bit, and her dad translated his beeping as really wanting to be scared again. She asked if he was sure and I managed to hit a button that did a somewhat positive sounding beep. Reluctantly she put the mask on again, and when he shuddered again, she quickly ripped it off and gave him a hug. Normally L3-G0's a "don't touch", but Lily was so short and concerned and gentle I wasn't worried. It's the kids patting him on the head that cave in the dome, or people tripping over his feet (I've learned R2 has big feet). Thanks to Lily and her parents for letting us share her picture and video. I start this clip just before Lily so you can see just why he's so scared of her costume. 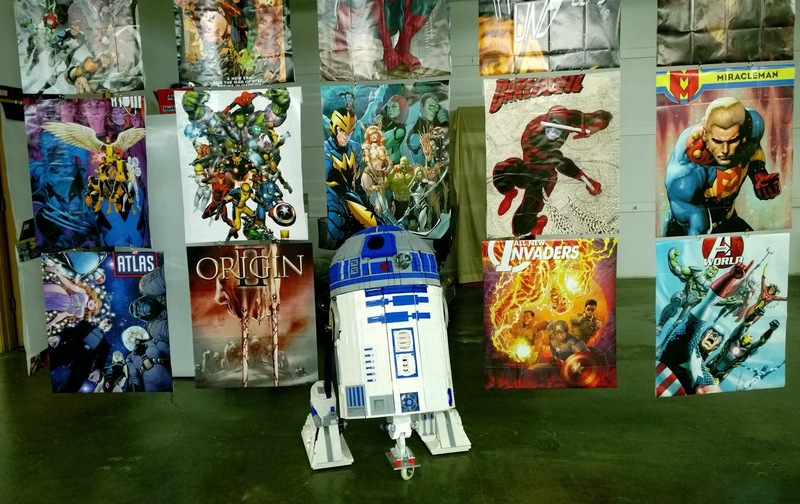 Photo of L3-G0 with other R2 Builders Club astromechs here at ECCC. It was great finally meeting other club members up here. We had a little mishap at the science fair. This is what happens when centripetal force gets to L3-G0's head and he spins too fast. L3-G0's not done yet, but he's getting there! We went on a test run to the Sealug meeting, which was held at ECCC's headquarters. 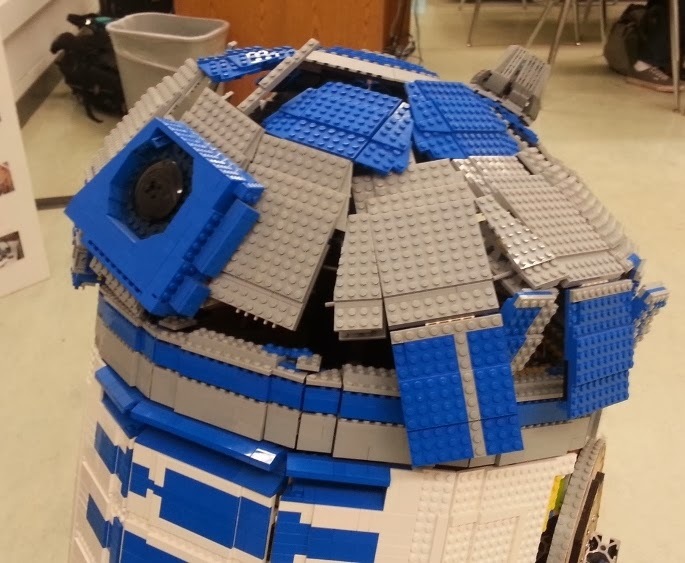 The kids loved chasing around a life size R2-D2 and were willing to look past his partially completed state. He's obviously missing his legs/shoulders, skirt, front foot skin and a few other details, but I wanted to test transporting him and see what problems I might encounter, and where he might fall to pieces. I don't want to be spending all of Emerald City Comicon fixing him! Sounds are also still on a random loop, and he has no dome LEDs at the moment (which means he can spin his head a ton). I didn't think I was going to get the dome reattached before the meeting, but Lara prodded me and it was mostly reconnected just in time (I was a few minutes late). He does great with his new shoulders in the car. Tying down's going to be tricky when the front foot cover gets on, but otherwise much more stable than when I took the frame to work. The new shoulders (laminated plywood) seem to be doing OK. Since he has 4 wheels in each foot, there's a lot of stress when he turns because some of the wheels have to slip. That pretty much destroyed the old thinner shoulder hub. I'd expected to need aluminum, but the plywood's doing OK.
On a related note, when turning hard, the feet can chatter a lot, enough to knock off the battery box (at 60 seconds in the clip one of them is missing). The outer foot panels chatter too. He can spin his head fast enough to throw off a holoprojector, which happens at about 1:20 in the video. With the throttle limit off on the motors he has pretty much a perfect amount of power, much faster than walking, but not so quick as to be uncontrollable or unrealistic. (My previous outing was limiting the motor controllers and he was just under walking speed). The vibration from pavement or even a sidewalk is a bit scary, he knocked a couple dome panels loose that way. The body held up really well. L3-G0 knew to expect rain in Seattle, but it started to snow at the end! We still have a ton to do before ECCC, crossing my fingers that we can get it all done! 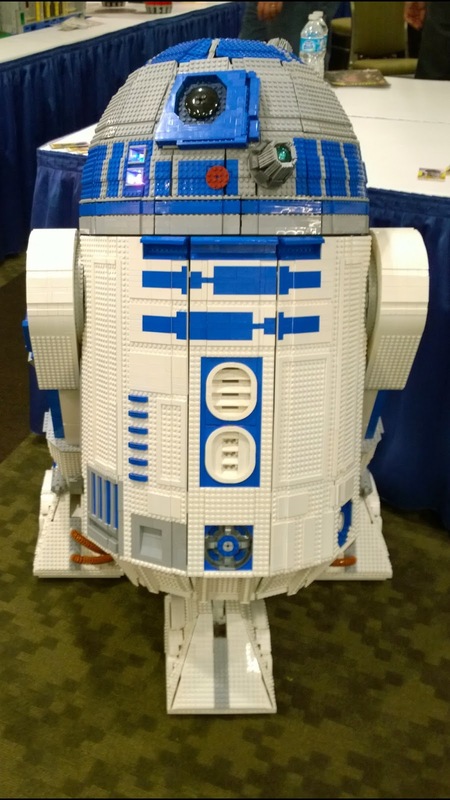 L3-G0 will be in "Brick Nation" at ECCC, the biggest Lego display yet at Emerald City Comicon. Ground floor of The Conference Center building. 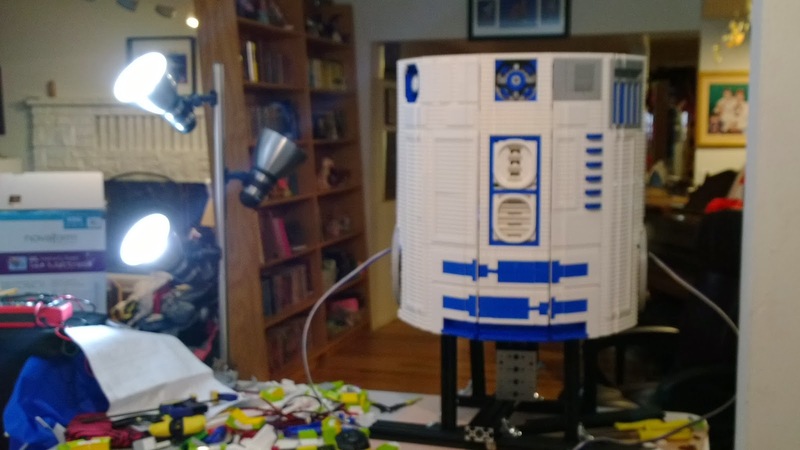 Update for my L3-G0 build, the full size Lego R2-D2. It's like cleaning where things get worse before they get better. Finally he's starting to get back together WITH his frame! And unfortunately the shim that the dome's bearing is on didn't fit once the body was bolted together. The original shim was hand cut, but now the body is in a laser cut 12-sided shape. Apparently without a frame it had more play. I'm hoping to get the dome back together for the Sealug meeting tomorrow, but it might not happen. He obviously isn't complete, but I'm hoping to see how well he transports. I'd rather mess up tomorrow with weeks to fix it than mess up on the way to Emerald City Comicon and have a few hours to fix it!.